When I first started looking for work at home jobs six years ago, I mostly found myself on Craigslist or Facebook. And you know what? The quality of the so-called leads I’d stumble upon were poor at best (and complete scams at worst!). I’m talking MLM, ‘business opportunities,’ programs and systems that promised work-at-home riches but delivered nothing more than pyramid-type schemes. Definitely not the real work at home jobs I was hoping to find after years of struggling in the corporate world. Now don’t get me wrong, you can absolutely find awesome job leads on Facebook, if you know who to follow. Craigslist too can offer up some unexpected legit leads as long as you don’t fall for common scams (which we’ll talk about more in a bit!). But the truth is, there are far more better places to look for the legitimate work-from-home job leads you’re after. What Kinds of Work From Home Jobs Are Out There? Before we discuss where to find work from home jobs, let’s talk about the type of work that’s out there. For the most part, any traditional office job can be done remotely. Thanks to the Internet and many collaboration tools available today, coworkers can seamlessly work together even when they’re many time zones apart. So whether you’re a customer service pro, administrative assistant, human resources rep, sales guru, marketing maven, (and so many more), there are any number of ways you can skip your commute while keeping your career. So, where can you find a consistent and reliable stream of work at home jobs to browse on the daily? Fortunately, there are a growing number of sites and job boards out there that offer frequently updated lists of legitimate work at home jobs. When online job searching became a thing, websites like Careerbuilder and Monster were the authority. And while they are still good sources for today’s job seeker, other job boards are known for offering home-based and remote-friendly jobs. This is the site startups use to connect with worldwide workers. And while not all jobs listed here are remote-friendly, a good number of them are. You see, many startups have built distributed workforces directly into their company culture, so they can have the best talent regardless of time zones. What I like about AngelList is the fact you can apply to multiple jobs with one application. How’s that for a timesaver? But first things first, you’ve got to create an account. It’s free. Then you’ll be prompted to create a profile. Your profile is what will make your job search successful, so be sure to take time completing it. Once you’re done with your profile and ready to start browsing, make sure you filter jobs by selecting the “remote OK” option. This will display only those jobs that have a telecommute option. Like LinkedIn, you can make connections on AngelList and start networking with fellow out-of-the-cubicle thinkers. And don’t worry, you can browse job listings and profiles in ‘private’ mode so your current employer won’t know you’re actively trying to escape your cubicle. At ProBlogger, you can find a lot of valuable work from home jobs as a writer. This includes blogging, copywriting, ghostwriting, content marketing and even proofreading and editing jobs. Even if you don’t consider yourself a professional writer, it’s still worth checking out the opportunities at ProBlogger. A lot of the jobs advertised are seeking someone who is an expert in a particular industry–food, fitness, health, beauty–so even if you’re not a writer by trade, your experience may still get you the job! 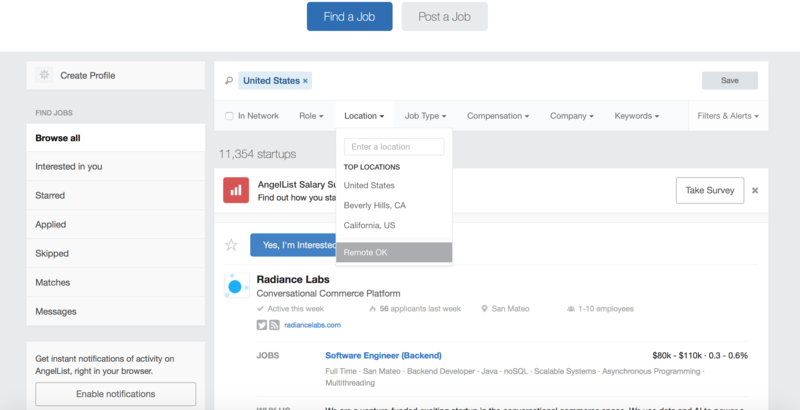 Indeed isn’t just a job board — it’s a job search engine. It crawls websites every day looking for job listings and puts them all together in one spot. Indeed is one of my favorite spots to look for remote and work from home jobs because you can search listings for specific keywords. To see what I mean, try typing “work at home” or “remote” in the box below. 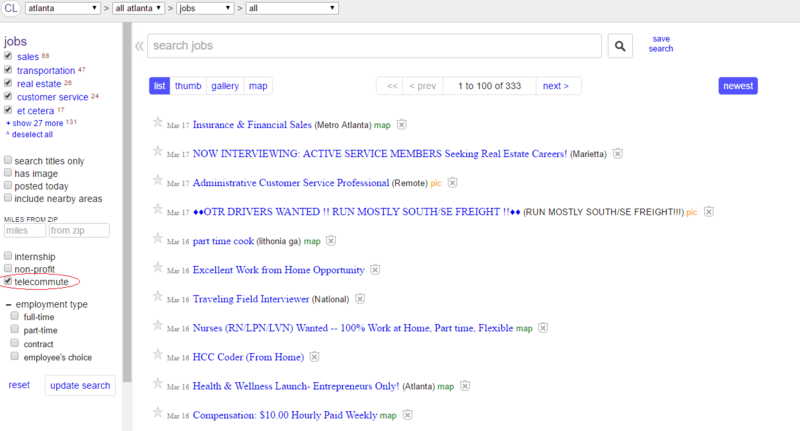 When searching for jobs on any of the Craigslist markets, you can choose to filter jobs that have a telecommute option. You just have to check the “telecommute” box on the job search page in order to return a list of all jobs marked as telecommute-friendly. If an advertisement just doesn’t ‘seem right,’ or is too good to be true, skip it! Always go with your gut. I’ve found that Craigslist advertisements that have nothing to hide (i.e., not a scammer) will indicate the name of the company and/or provide a link to their website and social media profiles so applicants can scope them out. If This gives you the opportunity to check them out before applying. If the only way to apply is through the Craigslist email relay, you should be very careful with what information you share! It’s a good idea to check your local Craigslist job board since some work at home positions are location-dependent (you can work from home but must live in a certain metropolitan area). After that, head over to the largest markets like Los Angeles, New York, Las Vegas, and Atlanta for work at home jobs. The name says it all. At We Work Remotely, you can find a variety of jobs that aren’t restricted by geographic location. Jobs are broken down by category. Some of the most popular include Programming, Marketing, and Customer Support. But the leads don’t stop there! You can also visit We Work Remotely on Twitter and, when you give them a ‘follow,’ start getting job leads directly in your feed! Find a selection of no-commute careers over at the remote-friendly job board, Skip The Drive. I’m such a huge fan of Remotive, and it’s not just because they have a job board filled with unique work-from-home jobs. What I love so much is the sense of community Remotive is building in the remote-work world. And you can join them (and 20,000+ other current and aspiring remote workers). Plus, there’s a super helpful blog and a twice-monthly newsletter brimming with on point, no-fluff advice. If you’ve never stopped by, be sure your familiarize yourself with this awesomely free resource for remote job seekers. Browse current listings or post your resume for employers to see at Jobspresso. Either way, you’ll open yourself up to remote opportunities you won’t find anywhere else. At any given time, you can find 1,000+ remote job leads! Many of the listings are from some of my favorite remote-friendly companies. What’s nice about using Jobspresso is they handpick their job leads. 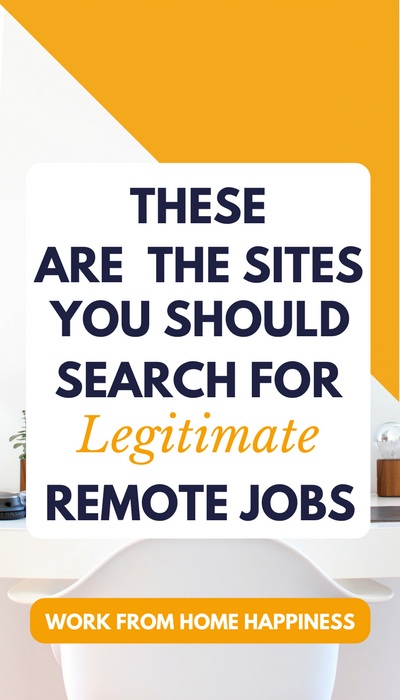 So when you browse their curated list, you can be sure that all jobs are actually telecommute, saving you plenty of time weeding through leads! And of course, don’t forget to give Jobspresso a follow on Twitter for daily leads on autopilot. How would you like to look through a list of 30,000 remote jobs? Well, at RemoteOK you can. If that sounds a little overwhelming, fear not! You can sign up for daily, weekly, or monthly emails that’ll deliver remote jobs directly to your inbox. Like many of the others on this list, Remote OK has an active Twitter account. Follow RemoteOK on Twitter for all sorts of helpful advice and, of course, daily job leads in your feed. Not all jobs listed here are remote, but you can specifically search for remote jobs or hybrid listings (jobs with a partial work-from-home option!). You’ll have to sign up and create a profile to get started. But once you’ve filled out 80% of the information, you can start applying for jobs. The Power to Fly blog has a weekly remote work roundup post, and unexpected (but super helpful) articles for women in the workforce. Go check them out and join the community! Or follow PowerToFly on Twitter for plenty of job leads and career advice for women right in your feed. If you really want to find work at home jobs right now, freelance marketplaces are great sources. There are literally thousands of jobs posted on these sites every month, all of which allow you to work from home. Not all freelance sites are created equal. You might prefer one over the others, and that’s okay! The best thing to do is get in there and have a look around. You may be surprised to see all the many ways you can earn money from home as a freelancer. Upwork is now the largest freelance marketplace after joining forces with first oDesk and, more recently, Elance. No matter your skills or experience, you can find plenty of opportunity to earn a living from home on Upwork. Some of the most popular job categories include writing, graphic design, virtual assistant, and developer. But really, if you can think it up, you can freelance it. The best way to get going is to jump right in and sign up. After that, make sure you fill out your profile completely before applying to gigs. It’s free to apply to jobs but Upwork does take up to a 10% cut of your earnings. If you like the idea of freelancing but want to secure steady work, Crossover can help. They work with companies seeking long-term freelancers. And all terms are clearly laid out ahead of time, so you know what you’ll earn and how long you can expect to work. But Crossover only works with the ‘best of the best.’ So make sure you take your time going through their application process. Doing so can make or break your chances of getting work through Crossover! I love CloudPeeps for the sense of community they give freelancers. It’s certainly a refreshing change of pace from the sometimes cutthroat marketplace platforms and bidding sites. Plus, CloudPeeps doesn’t just help you get one gig after the next. They’re on a mission to empower freelancers to create sustaining and successful freelance businesses. You’ll need to go through an application process to get in here. And, as a freelancer, you should consider this a good thing. Instead of a free-for-all of freelancers, the talent-to-client ratio is kept purposefully low so you always have a fighting chance of finding plenty of work to keep you busy. Fiverr is a little bit different than other sites on this list. Instead of actively applying to or pitching for gigs, you set up shop and let clients come to you! There’s really no limit to what you can sell here. Voice over work? Check! Logo design? You bet! Video testimonials? Of course! Really, you can get quite creative on Fiverr and offer all sorts of unique services for as low as $5. A lot of would-be freelancers think that there’s no way that Fiverr can lead to financial freedom, but that couldn’t be further from the truth. I’ve spoken with several Fiverr sellers who have found huge success — some earning as much as six figures a year! TopTal is an exclusive network of freelancers consisting of just the top 3% of talent worldwide. To keep the talent pool low, TopTal requires each freelancer to go through an application process. But it can certainly be well worth it to take the time to apply! Once you’re in, you gain access to jobs posted by big-name companies like Pfizer, airbnb, and J.P. Morgan. The connections you make on TopTal can lead to plenty of recurring work and referrals. Have experience in eCommerce, digital marketing, virtual assisting, or web development? You’ll fit right in as a freelancer at FreeeUp! Like some of the other platforms, you’ll need to go through an application process to become a freelancer here. As an added bonus, you won’t have to pitch for gigs! That’s right, FreeeUp matches talent with clients, which means you spend less time pitching and more time earning. To date, FreeeUp has successfully placed hundreds of workers with legitimate companies. You could be next! It’s true — your favorite social media platforms just also happen to be great sources of work from home jobs! In fact, I come across quite a few legitimate job leads each and every day just from logging into my social media accounts and seeing what others are sharing.You can too. If you know who to follow and what to look for! You might be surprised to learn that your favorite microblogging site is also a great source of work at home jobs. In fact, recruiters found such great success in promoting job openings in 140 characters or less that the popular hashtag, #TweetMyJobs was formed. Or you could skip all of that and simply follow my Work From Home & Remote Jobs List to instantly see updates from all the sites listed in this post. I’m amazed by just how many legitimate work from home jobs can be found on Pinterest. Although you might associate Pinterest with DIY, crafts, and recipes, it also happens to be an easy (and pretty) way to find tons of work from home jobs. Of all the social media sites, I’d say I’m most active on Pinterest because of the variety of jobs and work from home inspiration to be found here. I’ve created a collaborative board featuring pins from some of the best work-at-home bloggers in existence. When you give it a follow, you’ll get to see some of the most pin-tastic job leads (with lots of tips and advice) directly in your feed. Are you using this high-powered networking platform to scope potential job leads? If not, you’re missing out. LinkedIn has come a long way from strictly being a place to connect with your coworkers. Today, you can build your network and catch wind of work-from-home job leads you can’t find anywhere else. And with super-cool features like Open Candidates, you can ‘signal’ to recruiters that you’re interested in remote work without your current employer catching wind. Plus, there’s an entire platform built for freelancers who want to work with local and worldwide companies. Needless to say, it’s time to spruce up your LinkedIn profile so it attracts connections. There you have it – 19 totally free and easy-to-use sites filled with plenty of legitimate work at home jobs. And don’t forget to grab your free copy of my remote-friendly companies guide below! When you sign up for my weekly Work From Home Happiness Digest you get instant access to the guide (and a friendly email from me once a week!). The post These Are The Places You Should Look for Work At Home Jobs appeared first on Work From Home Happiness.